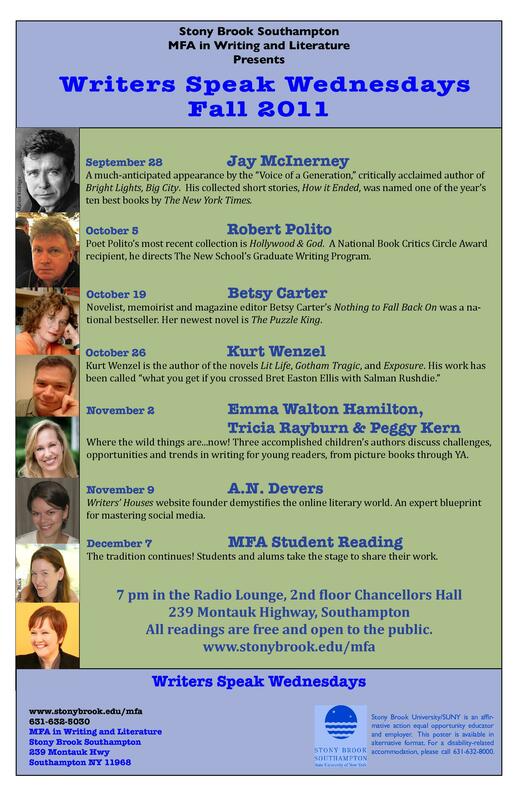 Honored to board a Jitney tomorrow to the Stony Brook Southampton MFA program to speak about how my visiting writers’ houses lead me to launch Writers’ Houses, and how I use social media to get the word out about writers’ houses. Writers’ houses forever! It’s can’t be a coincidence that The Hamptons have historically been a bohemia for artists and writers. 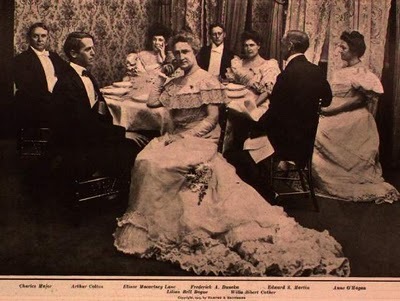 Willa Cather's Table at Mark Twain's 70th birthday at Delmonico's. Cather is third from left. After 10 years in New York, I’ve finally started to understand a thing or two about this city. One thing that I’ve learned several times over and am constantly reminded of is that New York University rules Gotham’s real estate. The University’s shaping the New York cityscape is beyond question, but it also has a cloak of invisibility on it. Once they’ve demolished and redeveloped, the city moves forward leaving hidden architecture and stories peering out from the alleys and corners of its buildings. Of course, NYU’s bullish expansion had a direct impact on the preservation of historic sites and buildings. In 2000, for example, a storm erupted around NYU’s plans to demolish Edgar Allan Poe’s house at 85 West 3rd Street. The facade was spared, but barely, and questionably. Today, Writers’ Houses welcomes poet, essayist, and novelist Terese Svoboda as a new Guest Curator. The title of Svoboda’s new novel, Bohemian Girl, is inspired by Willa Cather’s short story of the same name. 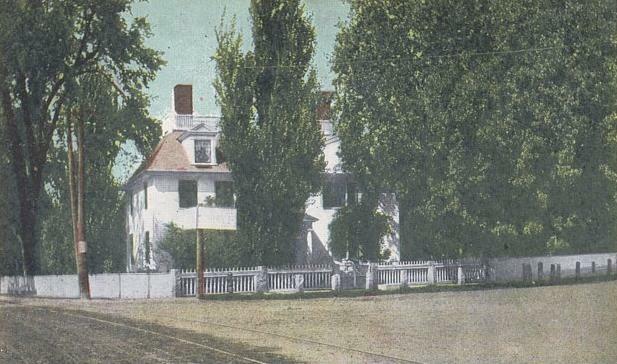 In her essay for Writers’ Houses, Svoboda hits the pavement in search of Willa Cather’s New York, and discovers a buried Bohemia. 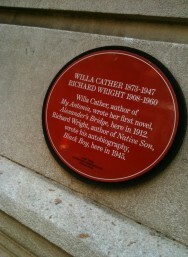 Cather’s New York is much changed by NYU’s mark on the city, but Svoboda finds that glimpses remain. Lucky for us, they glitter in the asphalt. In the past several years, I’ve visited more than half of this country’s writer’s houses and here’s one thing I’ve learned: the writer’s house extends beyond the four walls of their home. A writer carries images into their home and to their writing desk that come from the exterior landscape, from the fields and the forest, and the roads, and from the yard. Writers collect their environment, they pick it up like they are bundling sticks for kindling, like they are stacking wood. Sometimes a writer invests time in manicuring and maintaining the landscape. They do this in their work and in their life, perhaps, in some cases, more carefully and precisely than we recognize. Hence, when you go to visit Emily Dickinson’s house, you are treated to her gardens (which were reproduced precisely in an exhibit last year at the New York Botanical Garden) and where tour guides discuss her delicate, wonderous Herbarium at length. And when you go to Eudora Welty’s Mississippi home, you get a special tour of her garden. And the same is true for many a writer’s house. Seeing the “outside” of the home can tell you more than you expect. It can give you clues as to how they approached their work, how they constructed narratives and images and scenes. So, I was not too surprised when I read about a new book by Richard Horan called Seeds: One Man’s Serendipitous Journey to Find the Trees That Inspired Famous American Writers from Faulkner to Kerouac, Welty to Wharton. My immediate response to the title was that the premise seemed a bit of a stretch. And maybe it is, I don’t know, I haven’t tracked down a copy of the book yet, I’ve just read an excerpt. But still, I began thinking about it, and thinking about the homes I’d visited and the properties I’d toured and realized the outside of the homes are telling. They also hold meaning for us. They are important and we know they were important because they oftentimes make their way into the writer’s work. And in Regina Marler’s contribution for Writers’ Houses about Woolf’s house she explores how she came to acquire a third-generation Monk house geranium. And in the newest Writers’ Houses guest essay, by my friend the novelist Alexander Chee, we learn how Sarah Orne Jewett’s garden and her exterior landscape works its way into her work and into Chee’s family history. He also gets delightfully defensive about the idea of visiting writers’ houses. For that, I salute him. These houses are like heirloom plants, they can nurture us, but they can also grow wild, untangled, and become lost. It’s up to us to be the seed savers. Writers’ Houses has had a relatively quiet summer, not by choice, but by necessity. I’ve been writing and working hard on getting a book proposal out the door, and plotting for future writers’ houses endeavors. I’ve also been on the road a bit and fixing up a fixer upper in Asbury Park, NJ. I like to think of the town as Brooklyn-by-the-Sea, which is another way of saying that it’s awesome and not many people have realized it yet. So, it’s been busy, and I might owe you an email or a phone call. Or both. This website will feature regular content on a regular basis soon, we’ll be adding a weekly interview and a weekly roundup of events related to writers’ houses and books that might interest our readers. As always, we’ll continue to add houses and post about our adventures to various writers’ houses and literary landmarks. And hopefully, we’ll soon have new writers’ houses posters in the store. While this website has been quiet, it has gotten a couple significant shout-outs this summer. I gave a rather off-the-cuff interview to writer Leigh Newman for Oprah.com and last week Writers’ Houses got a mention on The New York Review of Books blog. Poet April Bernard’s post is titled “Here’s What I Hate About Writers’ Houses” so it was a wonderful surprise to be recommended given the subject of the piece. In her post, Bernard notes that she doesn’t like writers’ houses for “the basic mistakes” that are made and lists many ideas in the context of visiting writers’ houses that are admittedly irksome, like “That visiting such a house can substitute for reading the work” and “That private life, even of the dead, is ours to plunder.” Bernard is right to be concerned and she makes astute observations, as does Anne Trubek in her book A Skeptic’s Guide to Writers’ Houses, about what can go wrong at an open-to-the-public writer’s house. But ultimately I’m not swayed. Visiting particular writers’ houses has been illuminating and moving to me. I have understood a writer’s work that I love better after visiting a house. And I’m rather humbled by the energy people put into keeping these houses running despite huge challenges. Perhaps it’s easy to predict my response to Bernard’s piece. This website is evidence of my personal belief. I wouldn’t have invested all this time into it if I thought that visiting a writer’s house was a fool’s errand. Does that mean that all visitors to writers’ houses have the best intentions? It doesn’t. But I’ve visited a lot, a lot, a lot, of writer’s houses, and on the whole, I’ve met well-meaning visitors who visit houses to learn more about the writer or who are already head-over-heels for the writer’s work, or who are simply interested in history and architecture. I don’t see this as plunderous at all. Nor did Eudora Welty, who desired for her home to be turned into a visitable writer’s house after she died. Maybe her impulse was hubris on her part, maybe it was generosity. Maybe it was both. Does it matter? Now I know the books that were on her nightstand at the end of her life, and seeing them made my stomach knot and eyes water with appreciation. In an essay I wrote earlier this year for Lapham’s Quarterly, I explored some of the issues about visiting writers’ houses that arise. But, I also argue that visiting a writer’s house is a form of pilgrimage that is a longstanding and significant cultural tradition. Those who know me well know I’ve been working on a writer’s houses book slowly these past few years, but I’ve decided to sit on it for a while, and turn to another project that is concerned with the houses and life of one particular writer, and I can’t wait to have some news to share about it soon. Today, I’m also excited to announce Charles J. Shields as a new Guest Curator. Shields’ forthcoming biography And So it Goes: Kurt Vonnegut: A Life will be published by Holt in November. Shields has graciously contributed a short essay about Vonnegut’s West Barnstable house. The house is still in the Vonnegut family and it is closed to the public, which makes Shields’ contribution all the more special. Shields also blogs frequently about Vonnegut’s life and work here. My first encounter with Vonnegut was in middle school. 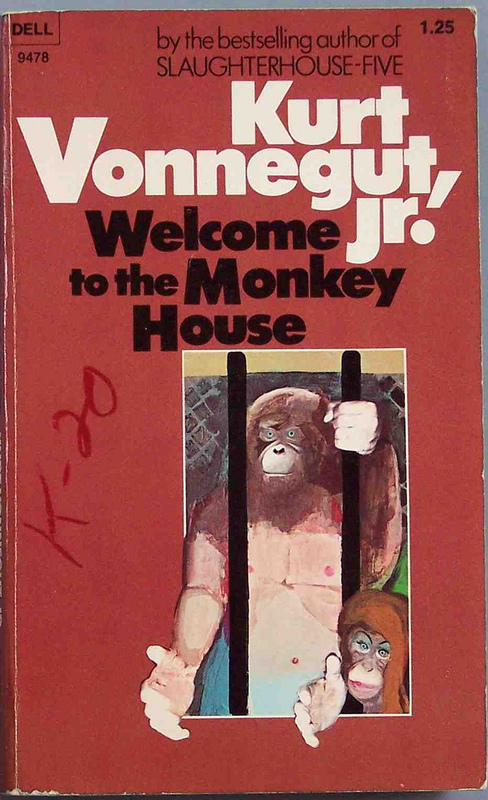 If memory serves me right I stole into my brother’s room one day and nabbed Vonnegut’s collection of stories Welcome to the Monkey House after Sassy magazine recommended it as a summer read. I was hooked. And, to be honest, I would kill for a tour of Vonnegut’s house. Here’s the thing: I’m a Southern girl, but I’m no debutante. And I’m relieved that my family isn’t of that privileged stock. I spent chunks of my childhood wading into creeks and streams turning over rocks to find crawdads. I never once had fantasies about a debutante ball or even a wedding day for that matter. I was tomboyish. And nothing spelled this out more than my inability to get into the film adaptation of Gone With the Wind when it often ran as the Saturday television movie. Besides the fancy accents, which I encountered in real life from time to time, I didn’t recognize anything about the movie as familiar. And I remember thinking of Scarlett O’Hara with the healthy fear of a person greeting an extraterrestrial for the first time. The corsetry was terrifying. I changed the channel. Instead, I came to respect and embrace Margaret Mitchell’s Gone with the Wind from an unlikely source, S. E. Hinton’s The Outsiders. When I was in 6th grade, there was no other book in my universe. When Johnny Cade is on the run for accidentally killing one of his high school arch rivals, he hides out with Ponyboy for days in a barn with only playing cards and Gone with the Wind to keep them company. I remember thinking that if the characters of The Outsiders could make parallels in their lives to this book, then it must be important. I eventually read Gone with the Wind and sat down to watch the movie all the way through, and I realized that my reaction to Scarlett is a reaction that many people have to Scarlett, she wasn’t someone we were supposed to emulate. She’s a curiosity to us all, a rare bird, confined and defined by the special conditions of her narrow upbringing. And now I think about the conditions that made it possible for Margaret Mitchell to write Gone with the Wind. Mitchell straddled so many worlds. She straddled an Old South and a New South. She navigated a changing expectation of women and challenged gender stereotypes. I mean this without an iota of condescension: Bless her heart. 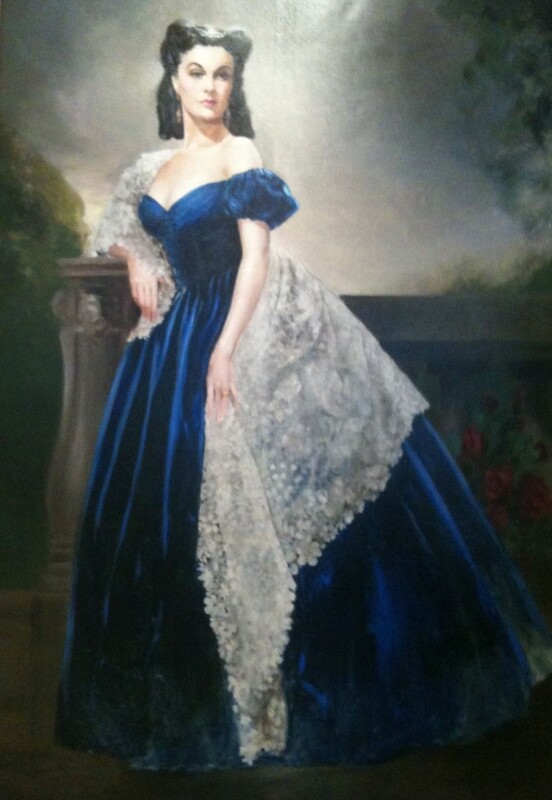 Today is the 75th anniversary of the publication of Gone with the Wind. I visited the Margaret Mitchell house last August. It’s every bit the smart girl reporter’s apartment I wanted it to be. Today, I’m happy to welcome Mitchell biographer, Ellen F. Brown, to introduce Writers’ Houses readers to the house. And in biggest coup of Writers’ Houses short life, I am thrilled to publish three (as far as we know) previously unpublished letters by Mitchell. They were written to author Adele Griffin‘s great grandmother and were handed down to her from her grandmother. Griffin has written a luminous and smart short essay to contextualize the letters for us. Bless her heart too.